Walton & Allen estate agents in Nottingham are delighted to announce they have been ranked as one of the best estate agents in Nottingham. Three Best Rated use a 50 point checklist to rate all estate agents in Nottingham, picking the best for reputation, history, value and overall experience. From the three estate agents handpicked, we stood out as the agent with the best ‘value’. We are also the only agent in the local area to offer 360 video tours, as well as a smartphone app for buyers, sellers, tenants and landlords. Our interactive window touch screens also advertise our properties 24/7 which means we never miss out on a potential buyer. Three Best Rated also took note of customer service, reviews and our experience. As a result, this put us at the top of the list within Nottingham city centre, beating over 50 other offices. As estate agents and letting agents we aim to provide the best possible experience for anyone looking to sell their property, let their property or gain independent mortgage advice. For this reason, we are extremely proud to have been recognised as one of the best estate agents in Nottingham. To book a free property valuation and to find out what we can do for your property, enter your details below. Alternatively, you can also call our office on 0115 924 3304. So, what are you waiting for?! Contact Walton & Allen who are the best estate agents in Nottingham city centre. Find out how we can sell your home. 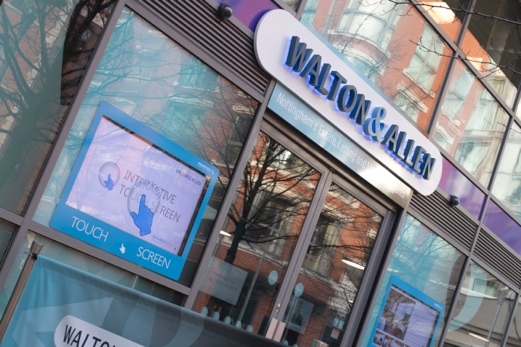 Walton & Allen were established in 2000 and have decades of combined experience working within the property industry. We provide property sales, lettings, mortgage advice, block management and property maintenance services throughout Nottingham. Furthermore, we have a huge active buyer database, meaning we can sell your property quickly and for the best possible price.